Ritual Chocolate Madagascar Bar. 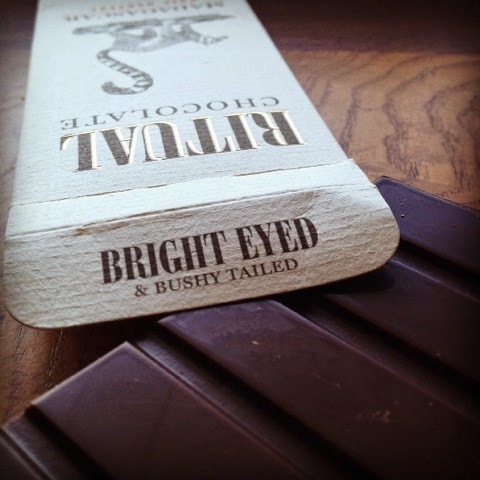 "Bright Eyed and Bushy Tailed"
Ritual Chocolate Madagascar 2012 Harvest brought my taste buds to life this morning. I noticed the smooth texture right away. Silky. Extraordinary. Soft, delicate nutty notes just prior to a burst of bright citrus that lingers through the finish. Absolutely beautiful. Every morning while the house is quiet and my palate is fresh I taste some of the most amazing craft chocolate in the world. This is by far one of my favorite rituals. Some chocolate is worth waiting for a clean palate to taste. A clean palate. Fresh. Undisturbed by lingering scents and flavors. Morning, before eating or drinking anything (except water), is one of the best times to find a clean palate. Before attention is pulled and torn in all directions. Uninterrupted. Quiet. Peaceful. Focused. Ritual Chocolate has just relocated from Colorado to the base of world renown ski slopes in Park City Utah (even the ski slopes are noted on the Google map!). I'm looking forward to visiting Robbie and Anna and the new chocolate factory when I ski Park City.